The end of August found me in Seattle for IFBC. I was not going to go. To be honest, I had my fair share of food conferences last year and had decided to sit back in the shadows to enjoy them this year. Upon returning from France, we had to high tail it to Seattle for business. I always love when I can combine a little business with foodie pleasure. During this trip, I was able to squeeze in an over-due coffee with Jackie and Lenny and I both got a chance to have a wonderful evening out with Dana. Well, Jackie planted a small seed during coffee, about IFBC; but, I buried it deep. Then over cocktails, Dana decided to shower that buried seed with a little water. By the end of dinner, Dana had showered that seed with sunshine – come back for IFBC, as well a girl’s weekend at her home with 5 amazing women (Dana, Joy, Cheryl, Tracy, and Kristina). By the time I boarded the plane the next morning, that seed was blooming and it was not long before I was pinging Dana and accepting her generous offer. Before I left I decided it was time to make this Gluten Free Apple Crisp leave as a treat for a certain someone. I felt amazingly blessed that weekend. A much-needed girl’s weekend tossed together with great food, lip-quenching cocktails and stimulating conversation with a brilliant group of women, who I now consider “friends”. We all came together, some of us knew each other from past events and others where new to each of us. Regardless, from the moment we meet up in baggage claim, I felt like I was with a long lost group of friends; conversations flowed freely, creativity was stoked and there was an amazing warmth around us the entire weekend. I thank each of them! IFBC did not fail me either. I was pleasantly surprised by three particular speakers who made me step back, think and then move forward. The first was James Oseland, the editor of Saveur. His speech oozed his love of food and travel, all wrapped up neatly together. My mind was provoked by every word. My fantasies were racing all around the world. He even made me want to keep blogging. I often consider giving it up but he re-lite the fire and made me want to pursue my passions even more. I could not get enough, I wanted more; I wanted to sit with him at a cafe, drink coffee and learn more! The next speaker who brought me in was Penny de la Santos. Now, I know Penny (I say that loosely as I have only taken a photography workshop with her) from a time before and I respect her. When I talk about Penny, I always say the same thing, “I love her story and how she got where she was”. You see, I love it when people succeed in doing what they are internally passionate about and that is Penny. She captures every moment and presents it in a way, that makes me feel it, taste it and completely experience it all visually. She is my “girl-crush”. The third speaker who really drew me in was Shauna James Ahern. Shauna is the Gluten Free Girl. I knew of Shauna as our paths have crossed in the past but I did not really know her. As soon as Shauna started sharing her journey and her deep struggles with gluten at IFBC, I was intrigued. I hung on her every word, waiting for the next detail, wanting more. I felt her pain and I wanted to know more. Before I even left Seattle, I ordered her book Gluten-Free Girl. I highly recommend this book, even if you do not have a gluten issue. Shauna’s writing is witty, warm and very passionate. I related to so many of her stories, of growing up a child of the 70’s – I loved the TV dinners and remember them “fondly”. 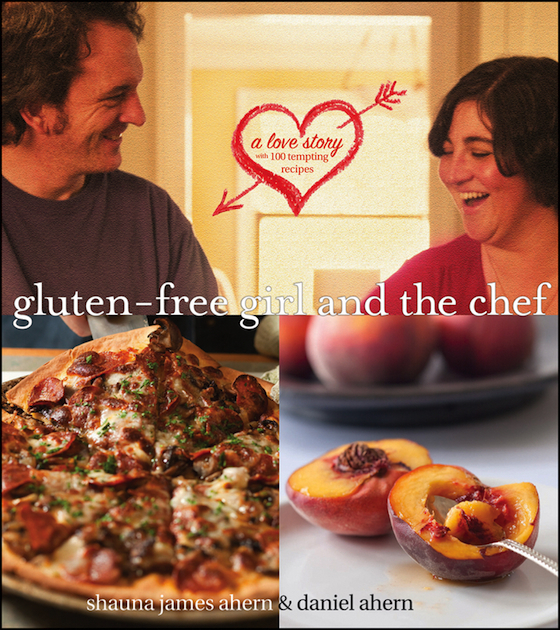 Not only does she share her journey but there are delicious gluten-free recipes throughout. We are lucky, we can eat anything; but, I still felt her pain. Having to rethink your way of shopping, cooking and eating. I could not imagine having to go through this radical of a change at this point in my life. As I read her book and shared my thoughts, with Lenny, we decided we wanted to do more. Why, because she had gone through this. As well, Lenny’s family is always complaining of stomach issues. We are always saying it is “your diet”, but it is a conversation that gets dusted under a rug. We could hardly preach without having done it ourselves. After a few conversations, we decided we would challenge ourselves by eating gluten-free for a month. We are very aware of where our food comes from and how it is made. But this challenge will make us even more completely aware of what we were putting into our mouths, down to every last ingredient. A couple weeks back, Shauna announced that she was looking for volunteers to bake gluten-free. This was perfect timing for our own personal quest. I immediately sent an email, saying we were in and that we were challenging ourselves to a gluten-free month. When I decided to accept this baking challenge, I had no idea of what I was doing. I was completely blind. Sure I had just finished Shauna’s book and was pretty confident that I could “cook” gluten-free; but, baking is another thing. 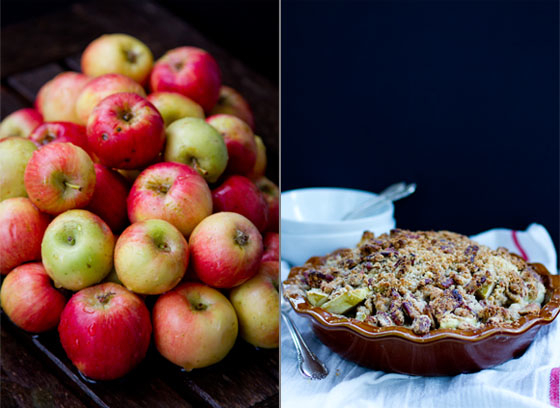 Last Thursday, I decided to challenge myself with two different gluten-free recipes, an apple pie, and pecan tart. The overachiever in me wanted to do it all. I had a hard time finding all of the ingredients I needed for the pie crust that Shauna shares on her site, so I decided I would “wing it” by using my favorite recipe. I picked up a gluten-free AP flour, a brown rice flour, pecans, nuts, almond flour, and tapioca flour … all gluten-free. I was eager and overconfident. My favorite pie crust recipe is a Dorie Greenspan recipe. I used equal portions of GF AP flour and the brown rice flour and attempted the recipe. It came together nicely, great texture; but, the taste reminded me of “sugared favas”. I was not happy. So I headed back to the market and picked up another brand of gluten free AP flour. This time the dough came together much better and the taste was really nice. When it came time to roll it out, it completely fell apart. TRASH! At this point, I was happy with just making a pecan tart. Again, I pulled out a Dorie recipe for a sweet tart dough. I used almond flour, brown rice flour and ground up pecans as my base. It was perfect. It blind-baked perfectly. It smelled amazing. I was so happy. Then I decided I did not want corn syrup in my pecan pie and I substituted it with pomegranate molasses. Huge mistake. Overly sweet. I could not stomach how sweet it was. TRASH! Sunday, I went into a desperate mode. I had to come up with a baked gluten-free something. I was in no position to retry my hand at the pie crust as well I was not in the mood for pecan pie. What I did have was a beautiful bowl of honey crisp apples, some leftover pecans, almond flour as well as the gluten-free AP flour – apple crisp. I tossed the apples with lemon zest, lemon juice, tapioca flour, brown sugar, and fresh ground nutmeg. The crisp was made of a blend of pecans, almond flour, gluten free AP flour, sugar and butter. The crisp came out perfect – the apples were still a bit crispy, a little sweet and the buttery and crunchy topping went perfectly. I served it with some leftover vanilla bean ice cream we made a couple weeks ago – it was delicious together. A couple tips; if you decide to try your hand at gluten-free baking: 1) plan ahead, some of the ingredients may be hard to find. Dig through Shauna’s site, she was a wealth of information to guide you. 2) don’t give up, if your first attempt does not work, keep trying; it eventually will. 3) find a gluten-free recipe and use it; try it out a few times before attempting to make it your own. 4) have fun; gluten-free is delicious. 5) be sure to follow us on our own personal gluten-free journey, it started with this apple crisp. In a large mixing bowl, mix the apples with sugar, tapioca flour, lemon zest and juice, and nutmeg. Lightly toss just to mix all of the ingredients. Put into a baking dish. In the same mixing bowl combine the ap flour, pecans, almond flour, and sugar; break in the butter using your hands, until the butter is pea-sized. Pat the mixture onto the apples. Bake for 40 minutes, until the topping is golden and the apples are soft but still a little crisp. 14 Responses to "Gluten Free Apple Crisp"
I did a crisp too:) I still want to try other gluten-free baked goods. I am determined now:) Your crisp is fabulous! Great post! Denise if that crust was decent I would really love that recipe. I do have to be gluten free and have been so for about 11+ years. I should have been far longer. If you think it is interesting finding the ingredients now you should have tried it back even 5 years ago. I have been following Shauna for sometime now. Her pizza crust is really great... pg 156 I think I don't know how it is as crackers but as a thin crust pizza very good... just make sure to use the plastic wrap to roll it out our it will end up in the trash. And her pumpkin soup has become a new standard here. I can hardly wait to see how your month of g-free goes, and what wonderful foods you come up with. You've offered sage baking advice: follow a recipe as it is written before making it your own and have fun. So true. I also happen to like King Arthur's gluten-free APF, especially for a quick batch of morning squash pancakes. Apple crisp is one of my favorite desserts, this one looks delicious. I'm blessed to not have to eat gluten-free, but I'm pretty sure I'd love this - gluten-free or not!! I remember no one wanted to go to Shauna's session because it was so early on Sunday morning. :) But so glad we all did and that you got so much out of it. I made a gluten free (and veg) gravy for Thanksgiving in honor of her - I wasn't brave enough to tackle a baked good.